Created for users of mechanical keyboards who want the lowest force keyswitch available, the Ergo Pro Low Force keyboard from Matias features linear mechanical switches that require a force of just 35 grams to actuate. 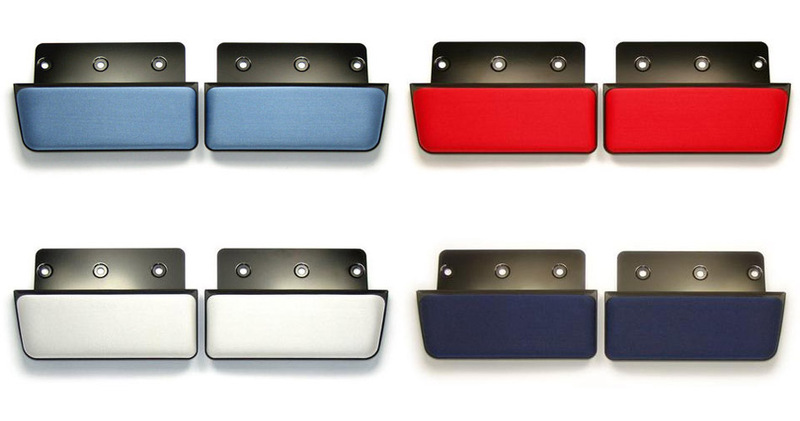 The Matias Quiet Linear switch incorporates an internal leaf spring to create a smooth, stable, low force feel. Like the original Ergo Pro mechanical keyboard (which provides light tactile feedback), the Low Force edition is an adjustable, separated keyboard that offers considerable ergonomic benefits, and can accommodate the typing speeds of even the fastest users. The keyboard features the same sturdy design as the original Ergo Pro, helping it withstand the intense workloads of high performance, demanding users. The Matias Quiet Linear switches on the new edition are even quieter than those on the original Ergo Pro keyboard, and are rated at 50 million keystrokes. The key cap legends are laser etched and will not wear off even after intensive use. Bonus features include a three-port hi-speed USB 2.0 hub and special Anti-Ghosting circuitry, which enables the user to type at high speeds without dropping characters. The separate left and right modules of the keyboard can be positioned shoulder-width apart, and tented if necessary, to help users of all sizes reduce the health risks associated with ulnar deviation, over-rotation at the shoulder, and pronation of the hands. 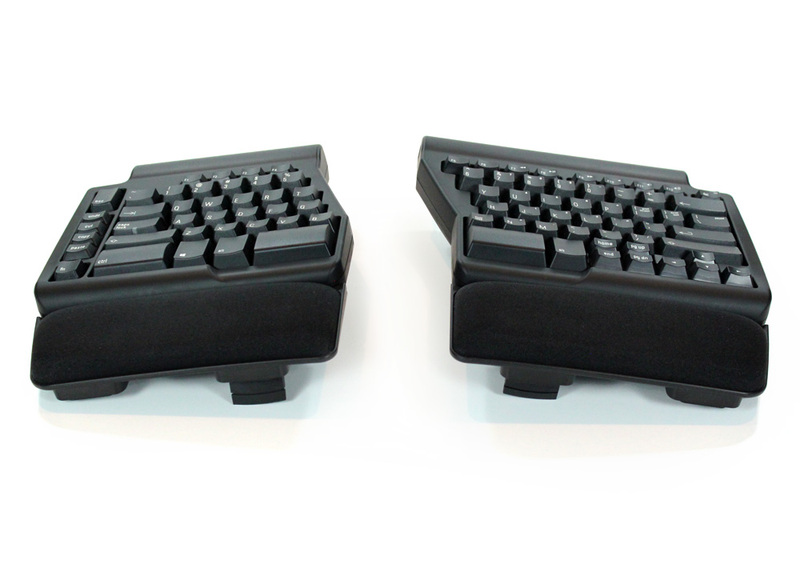 The feet on the Ergo Pro Low Force keyboard provide two mutually exclusive orientations. The two modules can be laterally tented 9° to create the "thumbs up" posture that reduces pronation. Alternatively, the inclination of the keyboard (which is neutral by default) can be adjusted to a negative inclination of 4.5°. The efficient, symmetrical design yields a compact lateral footprint of 14.5". Combined with the embedded numeric keypad, this greatly reduces the reach for the mouse. The spacious and generously padded palm supports prevent wrist extension. The palm supports are by default securely screwed to the keyboard but can be removed if desired. 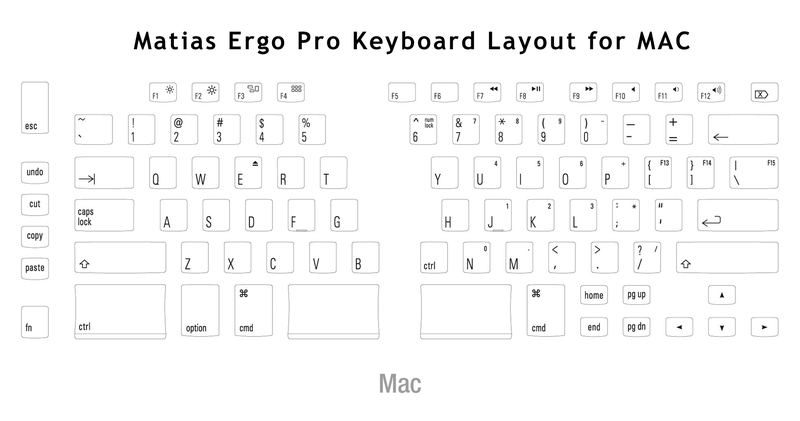 The Ergo Pro Low Force Keyboard is available in both PC and Mac models. 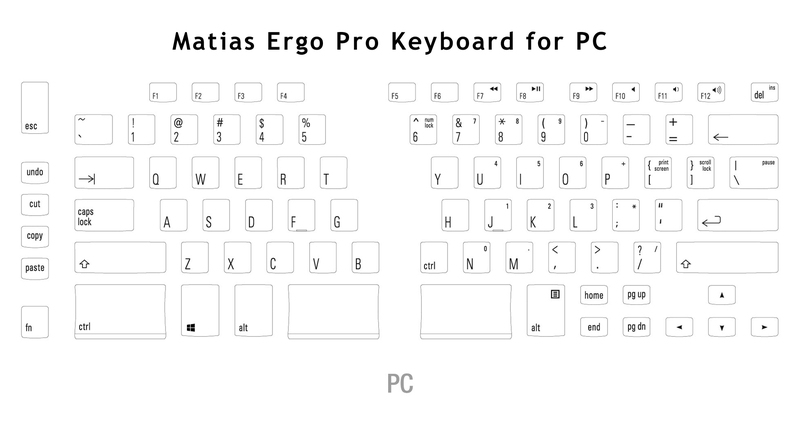 Note: If concerned about the lack of tactile feedback on the Ergo Pro Low Force Keyboard consider the original Ergo Pro keyboard, which uses Matias Quiet Click keyswitches to provide light tactile feedback and quiet operation. 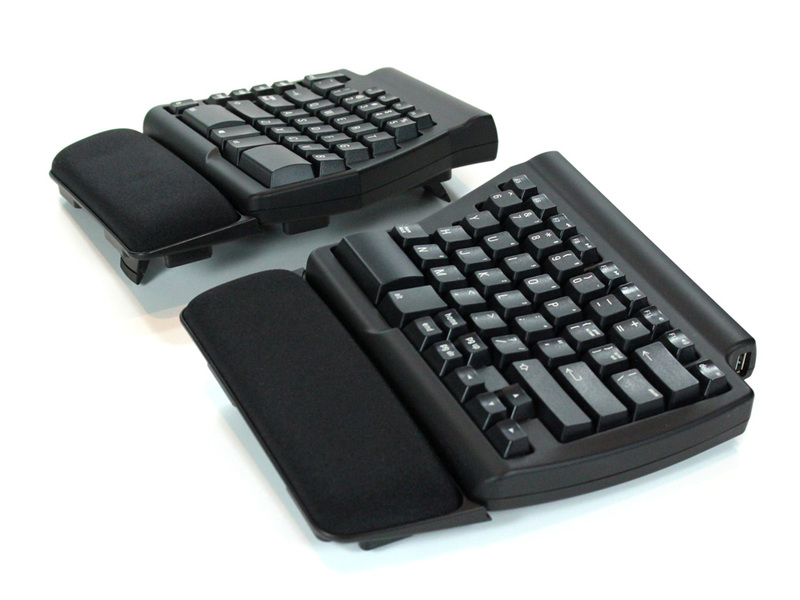 Improves Upper Body Posture - The separated design of the Ergo Pro Low Force Keyboard allows all users--whether small, medium or large framed--to position the left and right keyboard modules shoulder-width apart. This allows the shoulders, elbows, arms and wrists to relax into an anatomically neutral position, improving upper body posture and blood flow. Padded palm pads provide a comfortable base of support for outstretched forearms, leading to a reduction in the load that would otherwise be borne by the muscles of the shoulders. Note: In contrast to wrist rests, palm pads are positioned under the heel of the hand, and place no potentially harmful pressure on the underside of the wrist. 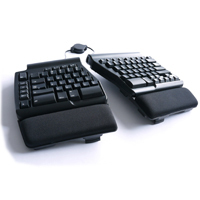 Reduces Strain on Shoulder and Neck - The compact symmetrical design of the Ergo Pro Low Force Keyboard allows both left and right-handed users to keep the mouse within their own comfort zone, vastly reducing strain on the shoulder and neck muscles of the mousing side. Note: The term "compact" refers to the reduced distance from the home row on a single side of a keyboard to the mouse, which is typically achieved by eliminating the number pad. The term does not refer to the width of a keyboard as a whole. 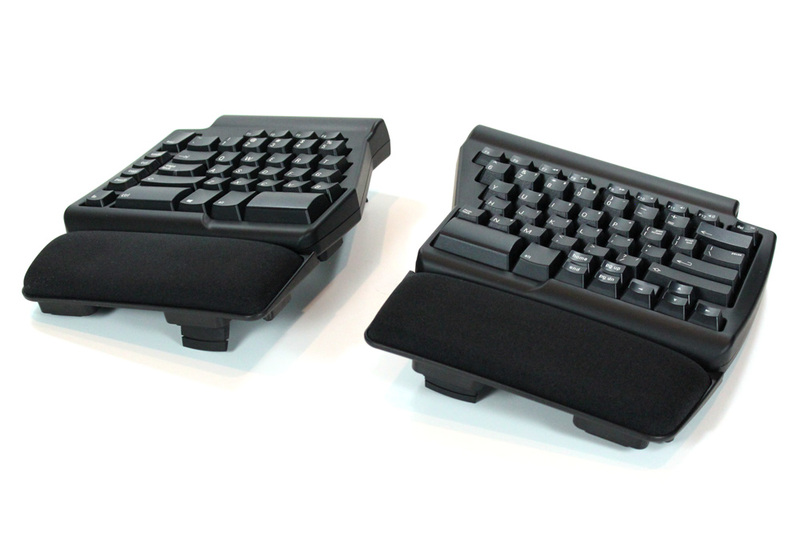 As such, even with left and right modules shoulder-width apart, the Ergo Pro keyboard is compact in design. Reduces Jarring Impact on the Fingers - Mechanical keyswitches do not need to strike the bottom of the keyboard to generate the keystroke. This feature, especially in combination with the full key travel distance (3.5 mm) and tactile feedback (indicating the point at which the keystroke has been actuated) means that users soon learn to use a lighter touch on a mechanical keyswitch than they would on a membrane or a scissor switch key. The result is often a considerable reduction in the amount of pain and fatigue experienced in the hands and fingers. Reduced Force Lightens Load on Fingers - The Linear switches of the Ergo Pro Low Force Keyboard offer an incredibly light 35 gram activation force. Users may initially find that they are "bottoming out" their keys but with practice most can learn to adapt to the lighter force required and discontinue downward pressure before the switch hits the bottom of its 3.5 mm stroke range. Once a user adapts they will greatly benefit from the reduction of necessary force, with the potential for a reduction in fatigue and/or pain from heavy keyboard use. Improves Typing Speed and Accuracy - Slightly concave key caps help users remain oriented on the home row, and enhance keying accuracy; tactile feedback when the keystroke is actuated discourages users from pressing a key down more than it needs to be, allowing a faster transition from key to key. 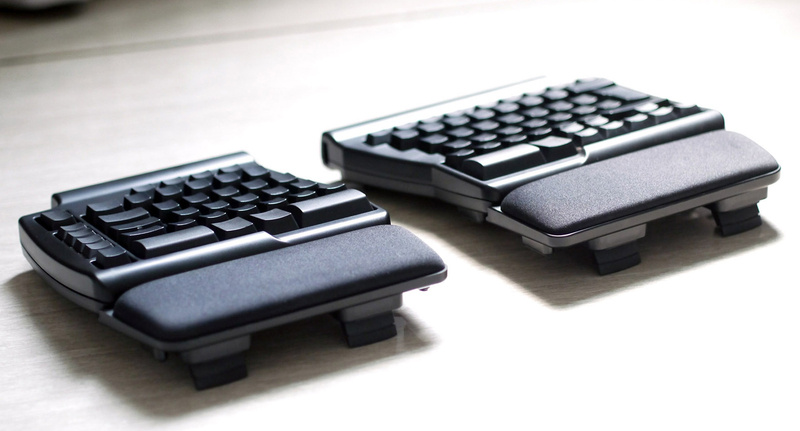 Matias "Quiet Click" Low Force LINEAR Keyswitches: Custom-engineered by Matias, the durable mechanical keyswitches are quiet enough to use in an office environment, and are almost as quiet as conventional rubber dome keyboards (in some cases - actually quieter). 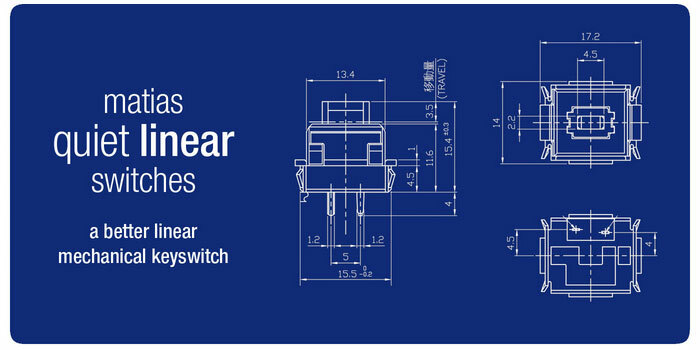 These linear switches offer a 35 gram activation force to reduce the load on the fingers. A unique integrated leaf spring is employed to provide an advanced level of stability to the linear movement. The result is that from start to finish the resistance level remains virtually unchanged. Tenting and Tilting Options: Three adjustable feet on each side of the keyboard give users the option of tenting the keyboard at a 9° angle or of tilting it at a 4.5° negative tilt, in addition to using it flat. Narrow Housing: At only 14.5" wide, the Ergo Pro Low Force Keyboard presents a very small footprint for an adjustable or separated keyboard. Removeable Palm Supports: Palm supports, covered in breathable fabric, are securely attached with six large Phillips-head screws but can be removed if preferred. Sculpted Key Caps: Slightly concave key caps on the majority of the keys help touch typists remain oriented on the home row, and significantly enhance keying accuracy. Large Ctrl Key on the Left Module: The large size and smoothly rounded shape make this frequently accessed modifier key especially easy to target, and more comfortable to hold down. A standard-sized Ctrl key is available on the right module. Easy to Reach Navigation and Cursor Keys: Navigation and cursor keys are grouped together, and positioned side-by-side, along the lower right edge of the right-hand module. Embedded Numeric Keypad: Much of the reduced width of a compact keyboard is achieved by eliminating the numeric keypad (usually seen on the right-hand side of standard-sized keyboards). The Ergo Pro keyboard substitutes an embedded numeric keypad on the right-hand module, allowing some keys to function as letters or as a numeric keypad. This embedded numeric keypad can be toggled on and off by holding down the function (Fn) key and pressing the number 6. Anti-Ghosting Circuitry: Also called "n-key rollover," anti-ghosting circuitry allows the keyboard to keep up with even the fastest typists without dropping or adding characters. Hotkeys for Frequently Used Functions: Dedicated hotkeys for Undo, Cut, Copy and Paste are positioned along the left edge of the keyboard. Laser Etched Keys: Legends are burned into the key caps with a laser, so they will never wear off. Media Controls: Holding down the function (Fn) key allows access to shortcuts for Volume Up/Down, Mute, Pause/Play, Next Track and Previous Track. 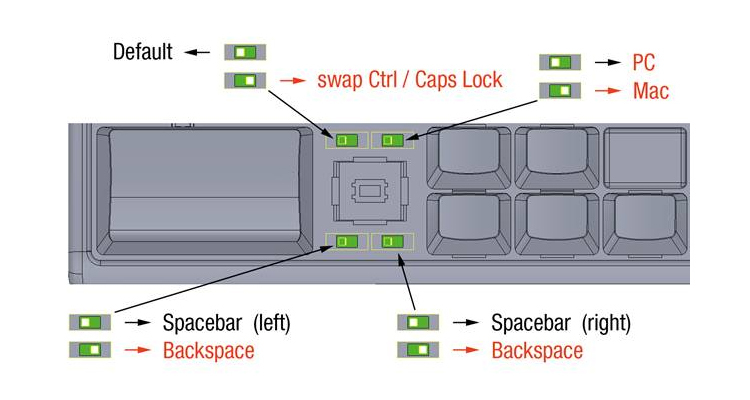 Built-in USB 2.0 Hub: Three USB 2.0 ports on the keyboard allow users to plug in additional devices such as flash drives and mice. Package Contents: Ergo Pro Keyboard (one left and one right module), 7.25" Short Bridge Cable (if user is not separating the modules significantly), 17" Retractable Bridge Cable, 6.5' USB Cable, Removable Palm Supports (one left and one right), six Phillips-head screws, User's Manual. Make sure the keyboard is properly positioned. Sit in your usual position at your desk and gently square your shoulders. Allow your upper arms to relax to your waist. Lift your forearms at the elbow and extend your fingers so that there is a straight line from your elbow through the centre of your wrist to your middle finger. Place the two halves of the keyboard on your desk or keyboard tray such that your arms and hands can maintain this position as you type. The modules ought to be shoulder width apart. Place the mouse on the side of your dominant hand. For most people, the compact design of the keyboard will bring the mouse close enough to the body. However, if your pain is more severe, you can prevent even more movement at the affected shoulder by positioning the mousing side of the keyboard closer to the centre of your body, and then turning it slightly so that your arm can remain perpendicular as you type. You will then be able to reach the mouse with very limited involvement of the shoulder muscles. Adjust the Ergo Pro Keyboard to fit "your" specific needs and usage. The range of options for adjustment are there to let you fine-tune the keyboard - take advantage of this factor. Monitor the amount of force that you are exerting. If you find yourself "bottoming out" on your keystrokes you are exerting unnecessary force. Not only will it tire your hands and fingers more rapidly, the repeated impacts on the finger tips can have a negative impact which can result in hypersensitivity in these areas. Adjust the keyboard occasionally to see if you have achieved optimum positioning. If you listen to your body it will usually first communicate through discomfort. If you listen at that point and change your usage or behaviour you may well avoid hearing the next level of communication, ie. PAIN.